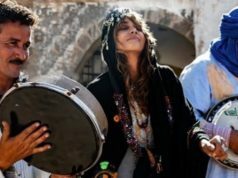 Rabat – Asmâa Hamzaoui made her Gnaoua and World Music Festival debut Friday night, playing a midnight show with her group Bnat Timbouktu at Essaouira’s Dar Loubane. 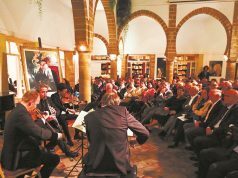 The small riad in a corner of the medina was quickly filled to standing-room-only after Hamzaoui and her all-women group took the floor. 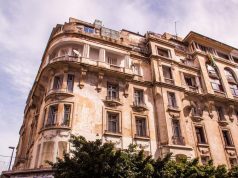 The young Gnawia’s hands danced on the ginbri’s thick gut strings with ecstatic ease, supporting her group as they sang through the Gnawa repertoire at one octave higher than usual. Joined at the climax by French multi-instrumentalist Loy Ehrlich on ribab, the Bnat’s comfort and power forced the audience off of their comforting poofs to clap, dance, and shout along. 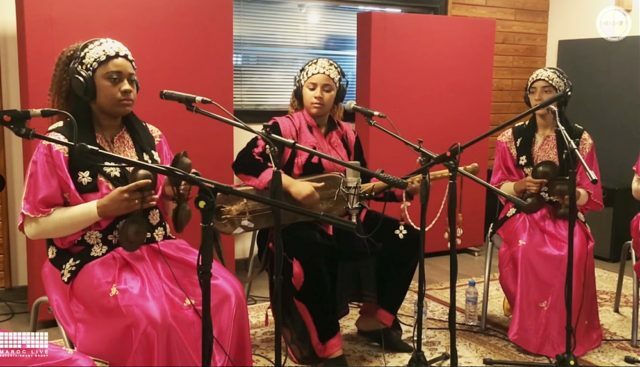 The 20-year-old Hamzaoui and Bnat Timbouktu represent a new generation of young women Gnawa music performers – mastering the brotherhood’s musical instruments, the ginbri (a wood-and-skin bass) and the qraqab (double castanets), has until recently been the domain of men. 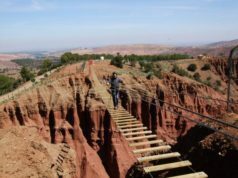 Women have always played a central role in Gnawa traditions, however. 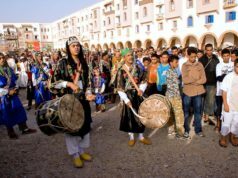 Most intimate Gnawa ceremonies are organized and hosted by women, and women make up most of those dancing. However, as concert performances like those of the festival gain increasing relevance for the livelihood of Gnawa musicians, the key role played by women in the tradition has become overlooked.